I spent my weekend working on two different quilts. The first is for a Quilt of Valor. The Memphis-Area Modern Quilting Guild is working together to create a quilt to honor a serviceman in our area. 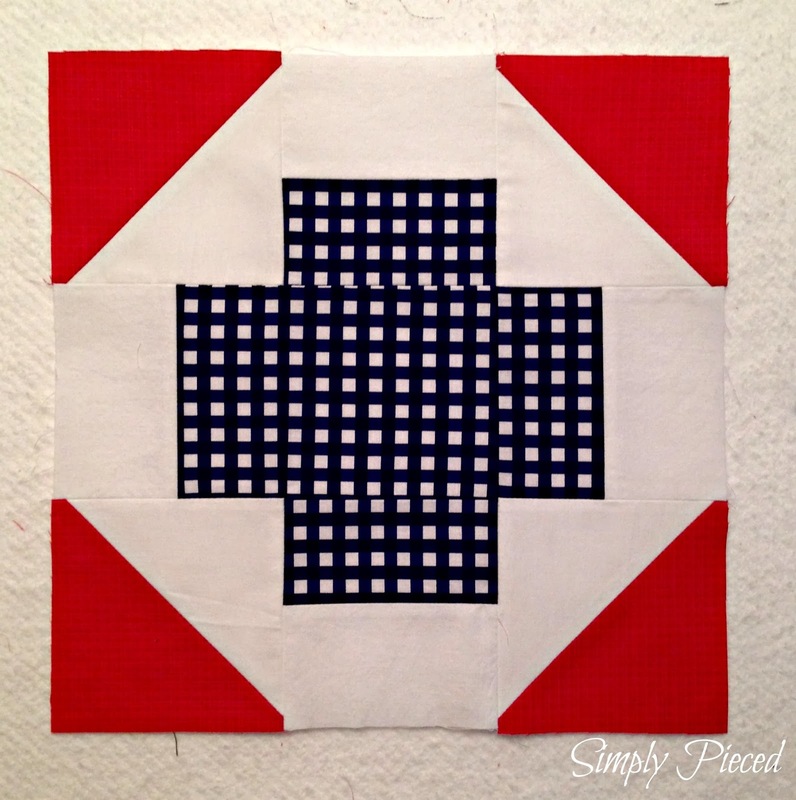 Each member is responsible for making three different blocks for this quilt and these are the three I chose. Can anyone tell me where I goofed on this last one? I got in too much of a hurry and totally skipped a step. I had the block completely put together before I even recognized my error. I'm also creating a quilt for my daughter for her birthday. She is turning 5 in a couple of months and I thought a big girl quilt was in order. 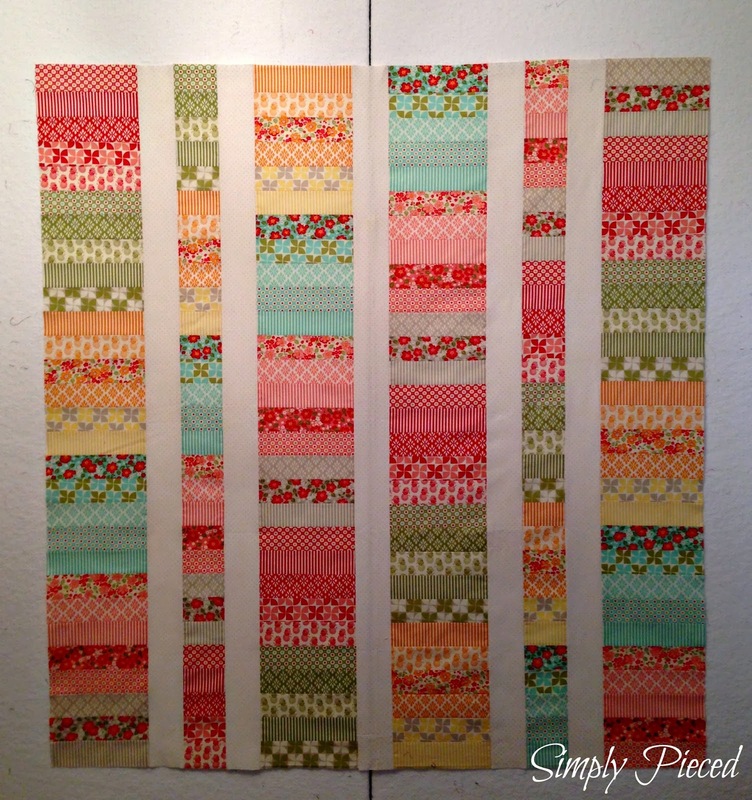 I finished piecing the top using a jelly roll of Marmalade from Bonnie and Camille and some Riley Blake polka-dots. My daughter has watched me piece this one together and has told me several times how pretty it is. She doesn't know it's for her and I don't plan on telling her until she finds it in a box she unwraps on her birthday. Of course, the best way to keep a secret is to tell the world wide web. :) Shhhh....don't tell her!!! I really love that middle block. It would make a great quilt all by itself. As the wife of a retired Navy pilot, I am moved by your blocks for the Quilt of Valor. Thank you for taking the time to honor our servicemen and women. You don't know how much it means to them. um, I would say that you didn't trim your triangles on the block in question (that is, if you were not asking a rhetorical question, lol). I love your modern quilts! Especially Batman. ;-D Wish we had a modern guild near here. I need a little push to move from reproduction to modern. I love all of your blocks especially that middle braid one! Sorry. I cannot find the goof you say you made on the last QOV block. All those blocks are great! Love your daughter's b'day quilt. She's right! It is pretty. I think you pressed the seams the wrong way on your block! That's OK, though. They are all beautiful and will be very much appreciated. 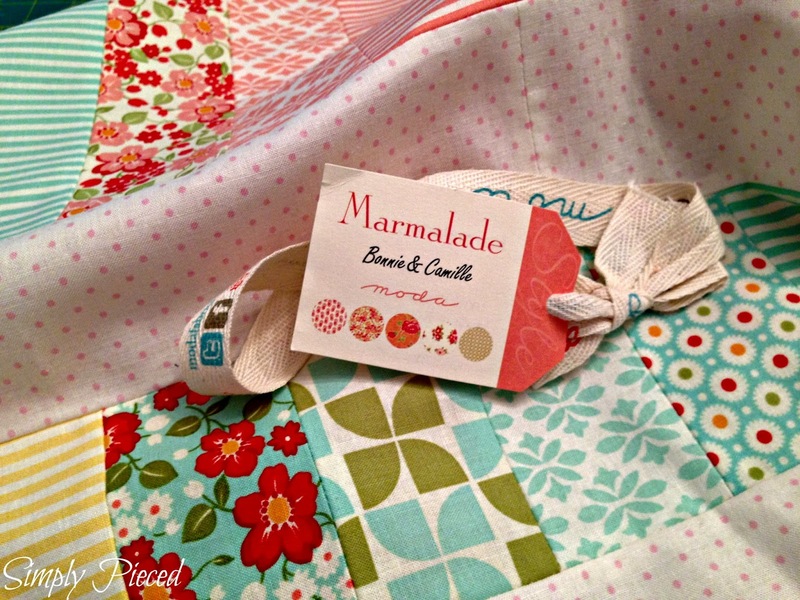 Your little one will be very happy with that quilt! You are on a roll! 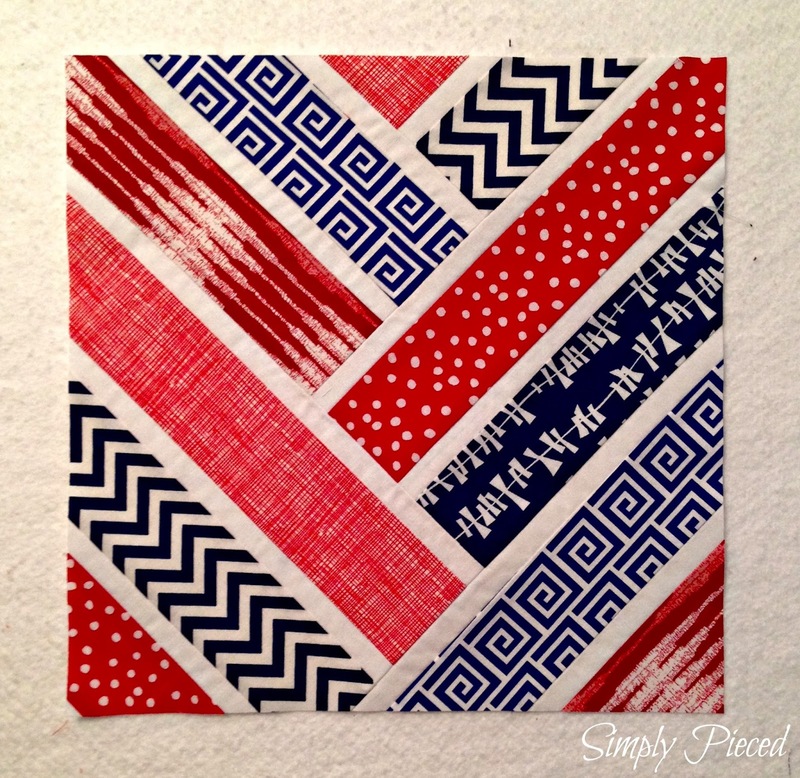 Each of your blocks for the quilts of valor look very nice... despite the peek-a-boo print. I think it actually adds to the block! And that sweet Marmalade top... Oooh! That is spectacular! What a wonderful surprise it will be! When she opens her present... be prepared for the biggest hug in history! I love all of your QOV blocks, I think I know what you did wrong on the third one, but why point out mistakes, it is now Folk Art and nothing more needs to be said about it. :) I love our daughter's quilt, bright and cheerful, I'm sure she will love it. 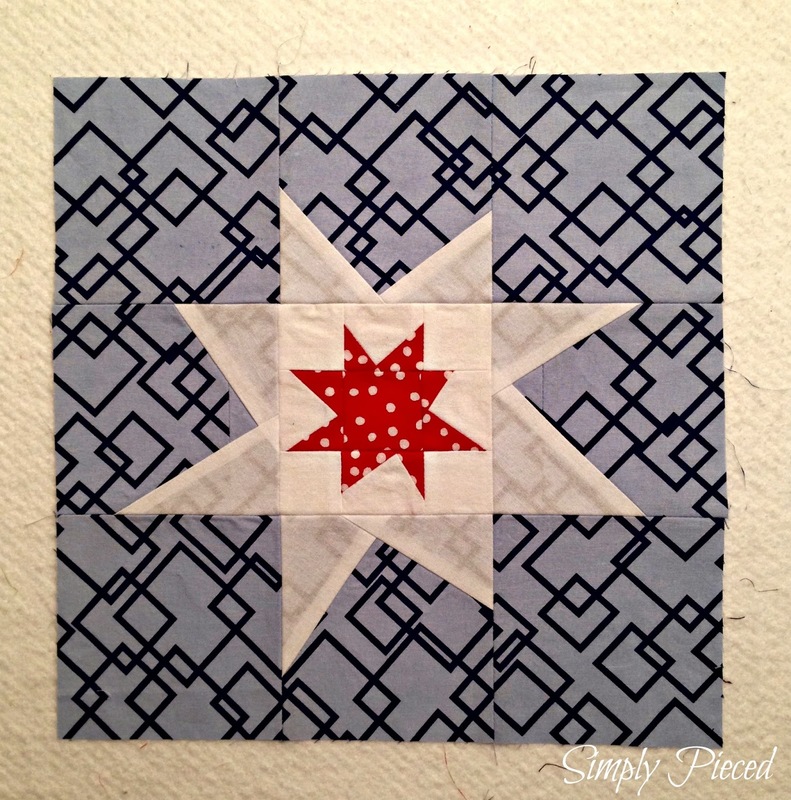 love the QOV blocks, and you know I love that Marmalade quilt! You didn't make a mistake on that third block . . . you invented a new technique! It actually looks nice with the background fabric showing through. I hope you didn't re-do it.